I’ve put Father upstairs. I had to park him on a chair first to take the bed apart. He sat there like a calf that’s just a couple of minutes old, before it’s been licked clean: with a directionless, wobbly head and eyes that drift over things. I ripped off the blankets, sheets and undersheet, leant the mattress and bed boards against the wall, and unscrewed the sides of the bed. I tried to breathe through my mouth as much as possible. I’d already cleared out the upstairs room – my room. Helmer van Wonderen is a Dutch dairy farmer who’s been reluctantly running a small holding with his father for his entire lifetime. Helmer is 55, and now he’s putting his father ‘out of sight, out of mind’ until he dies. What lies behind his petty cruelties, and what is the source of his hatred for his father? On the surface this book seems merely to be about the humdrum daily life of a melancholy and rather mean-spirited man, but there is much more to it than that. The story is haunted by death, grief and loss for what might have been, and the brooding sense of foreboding is curiously seductive despite the spare first-person prose. For Helmer is a surviving twin, and the death of his favoured younger brother Henk was catastrophic for him. His studies in Amsterdam were cut short, and he had to return home and help his hard, uncompromising father to run the farm. Why does a man forego the life of the mind to acquiesce in this mind-numbing occupation for so long, well after he is of an age to make his own way in the world? What else is he repressing? Helmer hates his father. He was obviously a violent and punitive man, and his refusal to pay for Helmer to go to university meant that the boy had to fund it himself. But now Father is old and dependant, he is at Helmer’s mercy and Helmer takes full advantage of that with restraint only barely controlled. He shifts the old man upstairs where there’s no heating, he’s mean about food, he’s petty about not cutting things up for him, and he leaves him alone for hours, not just ignoring him but also depriving him of company when visitors offer to go up and see him. These visitors bring change to this world suspended in time. Ada the neighbour has two small boys and an ‘invisible’ (presumably unsatisfactory) husband; the tanker drivers who collect the milk come and go, moving on in their lives as Helmer seems not to. But his inertia is challenged by a letter from Riet, the woman who was engaged to his brother and was driving the car in which he died all those years ago. Recently widowed, she wants to renew the association, and for reasons unspecified she wants Helmer to take on as a farm hand her son – also named Henk. Henk is the adolescent that Helmer could never be. He smokes, he drinks, he leaves his room in a mess, he doesn’t do his share of the housework and he doesn’t get up at the crack of dawn to milk the cows. But he’s also funny, and fun, and although petrified of Helmer’s harmless donkeys, he is relaxed around the old man who for all his vulnerability still has Helmer in his thrall. He is the catalyst for Helmer’s reassessment of his life. There are so many elements to explore in this deceptively simple book, but it would spoil the reading to talk about them here. There are countless reviews online, but I suggest The Mookse and the Gripes and Kevin from Canada for a start. Ramona Koval interviewed the author at the Radio National Book Show. The translation has won a variety of prizes, but most significantly it was the skill of the Australian-born translator, David Colmer that brought the book to international attention and enabled it to win the IMPAC. Source: review copy courtesy of Scribe, but I also bought a copy from Readings ($29.95), and they now have a cheaper edition as well. Sounds really fascinating Lisa and the sort of meditative spare book I rather like. Have no idea if I’ll ever find time to read it, but at least I’ve read your review. I agree with the “mull over” thought. I also think you have captured another central idea with “inertia”. While claustrophobia, revenge, history and even external change (the observation about the tanker drivers moving on in life is apt) all are present in the book, they serve mainly as external threats that keep the central character immobile. 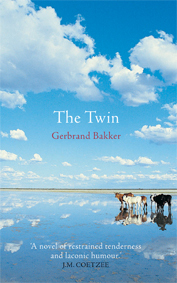 I like The Twin very much when I read it; it is also one of those novels that has improved with memory. I look forward to a re-read but will probably give it a year or two. Hi Kevin, one of the ideas that occurred to me was that men and women might read this differently – because there are so few novels which tackle the relationship men have with their fathers. The silent hostility between these men, all this repressed hostility and love, might seem foreign to women who typically have some kind of emotional release through talking with friends or family. But I also wonder whether there might be something ‘Dutch’ about it? Is there something in Dutch culture that leads to repression of emotion?? Interesting discussion. I’ll just add that I seem to have read quite a few father son novels in recent years: Toltz’s A fraction of the whole, McCarthy’s The road, Verghese’s Cutting for stone, Temple’s Truth, Banville’s The infinities, to name a few. Astonishing really. And in all there is silent – or not so silent hostility – except for The road in which the son is a boy still who looks up to his dad. As for Dutch culture … perhaps but that may be a generalisation. ANZLL will be discussing this book later on in August this year, and I predict that this will be one of the issues that we try to tackle. I’ve never been to the Netherlands, but I really don’t have any preconceived ideas about their ‘national character’ if there is such a thing. I hear Aussies described as laconic, Californians described as navel-gazers, and Brits labelled ‘stiff-upper lip’ and it always seems to me that while there may be a grain of truth in these generalisations, that they rarely mesh with my real life experience. I have two colleagues of Dutch descent and knew quite a few from the days when I was involved in an Indonesian Friendship society, and they all seem as different from one another as anyone else. But then, they’re not in Holland; they’ve been influenced by life in Australia for many many years. However my English teacher at Uni High told us that some *languages* are so spare (he specified Scandinavian languages) that it is very difficult to express some ideas and emotions, and this is partly what I was wondering about with Dutch. This paucity of language is true of all languages in some form or another, I expect, for even English, with all its rich vocabulary and texture, has no word for a parent whose child has died, or a surviving twin. Is this because the English are expected to soldier on and not talk about this kind of loss (whereas the words widow/widower are in common use)? French, Italian and Spanish being gendered languages have no way (as far as I know) of *not* specifying a gender: you can’t say ‘a friend visited me’ without saying whether it was a male or female friend’. In some circumstances, you may have to lie since you can’t be vague. Indonesian, with no way of indicating the fine gradations of past tense that we have in English, (I went, I’ve been, I had been, I was going etc) can’t express these nuances. is this because they are a forward-looking people? Language is culture and culture is language, and I’d love to see someone who reads in both Dutch and English to comment on The Twin! I’ve had this one on the wishlist for awhile, so now it looks like I *must* read it. Kim, I should read more Irish fiction! I should give up work and just read books 365 days a year, yes, yes, yes! Well, I’ve given up work and I have to say I’d doing far less reading than I was doing when I was working 10 hour days!! Yep, now what you mean kimbofo … I thought my reading would increase dramatically after I retired but it hasn’t at all. I’m not doing less but I’m certainly not doing a whole lot more either. So much to do … and, I don’t feel comfortable spending time reading when others are out and about doing things. It must be the protestant work ethic! Deceptively simple perhaps, but complex themes. I know what you mean about some books taking a long time to read because they stop you in your tracks and make you think. The next one I’m going to review is like that. Thanks for visiting mind and apologies for comment-neglect! Have you read it, Tom? I checked A Common Reader for a review but couldn’t find it in your title index.